I have written a couple of reviews about e-reading applications for Apple’s mobile devices simply because I think e-reading will eventually become the main way, if not the only way, future generations will access and read books, magazines, PDFs and other traditional print material. The challenge though for e-publishers is to make e-reading programs and services feature-rich but also easy to use. 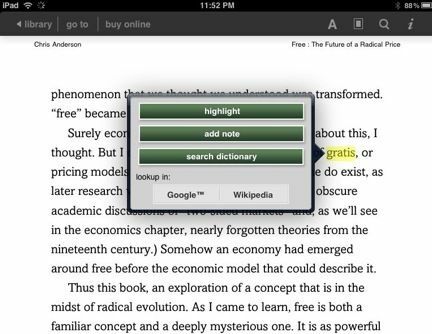 The recent release of Barnes and Noble eReader [iTunes Store link] for the iPad has a few unique features that Apple and Amazon could learn from. 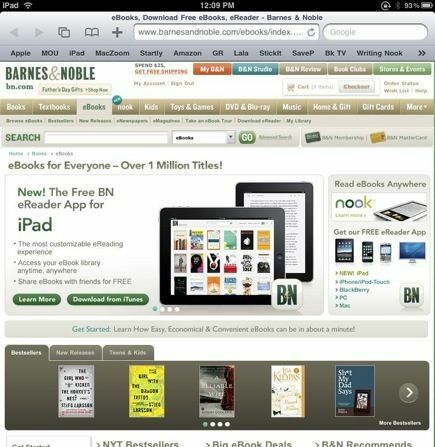 Just like Apple’s iBook and Amazon’s Kindle for the iPad, the Barnes and Noble eReader has a similar user interface for downloading and reading ebooks. 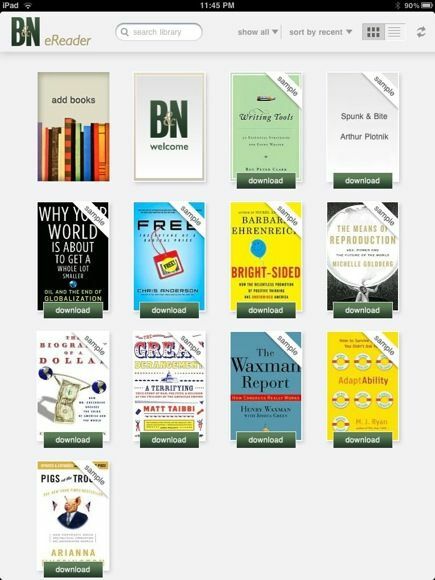 The library page of the eReader offers a nice graphic display of all the books (both sample and purchased) that you download from the store. The management of downloaded material is a little better than the in iBook and Kindle apps, in that it provides a way to view downloads according magazines, newspapers, ebooks, or archived material. This becomes essential when your library starts filling up with 25 or more publications. Another great feature in the Barnes and Noble eReader app is the ability to pull up (by tapping a small menu icon at the top of the app)ï»¿ a synopsis of a selected book by holding down your finger on the cover. The resulting info window is also how you can access a book for purchase, as well link to your bookmarks, notes/highlights. 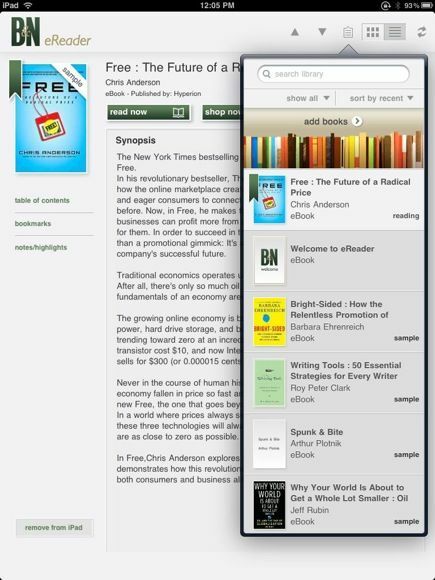 The drop-down column window (a great feature in many iPad apps) provides you access to all your other books your library. Adding and accessing books in your library entails clicking the “add books” button in the home library page, which will open B&N’s online bookstore in Safari. Browsing books in Safari on the iPad is not as streamlined and convenient as browsing them in the iTunes bookstore; thus, I prefer to browse Amazon and B&N e-books on my desktop web browser. It’s simply a faster way to add free sample books to the library. 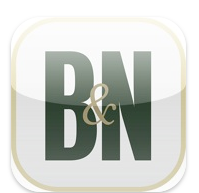 Reading ebooks on the BN eReader is also similar to the other ebook apps. You tap and swipe to turn pages, and you can change the font, font size, text justification, and the color of the page background. Unlike the other two apps, however, you can save your preferences as a theme, which means you can create one theme for daylight reading, and another for nighttime. Or you might create a theme for a particular genre of reading. There’s also an option for using the “publisher settings”ï»¿. This is interesting in that it means the publisher could possibly customize the layout settings to fit the content and design of their e-books, especially textbooks and manuals. The annotation features of the BN eReader are also slightly better than the other two apps. When you want to highlight a sentence or passage, you press your finger down on the first word of the passage and drag to where you want the highlight to end. 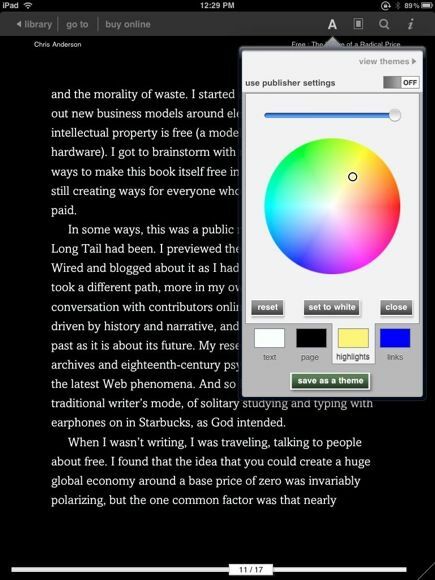 Unlike with iBooks and Kindle, you don’t have to tap first to bring up a menu item to start the highlighting. The menu item pops up after you lift your finger. This may not seem like a big deal, but it means one less tap in the process of highlighting text or adding notes. The highlight approach is also how you select a single word or phrase and look it up in Google, Wikipedia, or the built-in Merrian-Webster’s Pocket Dictionary, which means you don’t have to leave the page to look up a word. Clicking the “go to” menu item when you’re on a page, you can access a publication’s table of contents, your notes & highlights, and your bookmarks. Again, this drown-down menu item is better than the similar feature in iBooks and Kindle, because the drop-down window appears over your current page in a side-bar fashion. You tap on a note, bookmark, or title in the contents to navigate to that selection. The bookmark (+) icon for the app is almost hidden at the bottom of each page. It took me a few minutes to find it. But at least it’s there. Interestingly, this simple feature is missing in the iBooks app, in which highlights serve as a bookmark. One major issue that the developers of BN eReader app could address is a way to lock a page when annotations are being added. Sometimes when you’re trying to make highlights, the page slides down making the process tricky. As with the Kindle app, you can also synchronize your notes, highlights and current reading position with the BN eReader for the PC. This feature is forthcoming in the iPhone update of the app. These are useful features that are missing with Apple’s iBooks service. 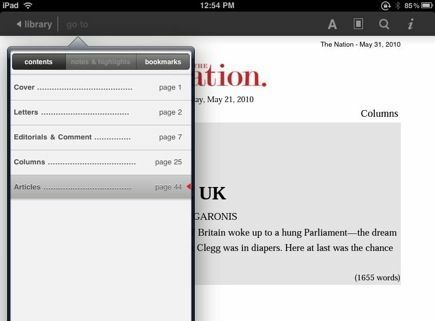 It may sound a little pesky to talk about minor (and major) differences between these three major e-reader apps, but if e-publishing and e-reading is ever going to be useful to students and researchers, the apps themselves should be feature rich, allowing users to annotate text in more productive ways than with the traditional paper format. Out of the three commercial major e-reading services, B&N is the only one offering sharing capabilities, though they are limited. Its LendMe technology allows users to share eBooks with friends for up to 14 days. However, when you lend a book, you will not be able to read it your ebook while it is on loan, but you always get it back. These type of DRM restrictions are something that will develop and change over time with e-publishers, but I can also see this type of technology being used to create virtual book clubs or courses. If e-books can be shared, why not also be able to share notes, book questions, and discussions between friends and contacts? Overall, I think the Barnes and Noble eReader is a great app. In my view it’s much better than B&N’s Nook eReader user interface, which is very awkward. The only advantage of that device for some users is that it’s a smaller and easier to hold and carry than the iPad. Let us know which e-reader you are using with your iPad. What features would you like to see in future updates?